WORKING AT HOME TAKES A PLAN FOR SUCCESS | Cook, Party, Enjoy! Working at home can get the best of you. I was feeling like I couldn’t handle everything on my plate. It really isn’t that much but it just seemed like the day got away from me. Then I remembered…Structure I need structure to do it all. Creating this blog has now given me a connection to people I had lost after retiring. But it has made it necessary for me to regroup and remember my Work at Home Plan to make sure I stay on track and don’t procrastinate. I have certain guidelines for my pampered chef business but adding the blog has made it necessary for me to rethink how I manage my time between pc, my blog, and my family responsibilities like watching Zachary, my 6 year old grandson. So I have gone back into my files and pulled out my Time Management stuff and I am putting myself on a schedule. I did remember how important it is to make a *work place at home specifically for working on your career. I thought I would share some of my tips with you in case you are facing the same problem. In a traditional job you have a scheduled time to work each week. You too need to consider “office hours” it is an important element to consider if you want to be successful. It isn’t easy balancing home and work, sometimes household tasks creep in and try to steal time from your business demands. Try balancing household tasks and business demands by breaking up your work day to allow you to do those everyday necessary household tasks and still have work time and no guilt. The benefits of this approach will quickly prove themselves. Decide how much time you are giving your at home business. Set a start/stop time each day (maybe in several blocks) for work, if your home demands fluctuate, a good practice is to plan your week on Sunday allowing for the changes but still giving you work/home structure. Make sure you put in a consistent number of hours each week. Working hours are flexible, but are not optional. help you to set boundaries. When you are ‘scheduled’ to work, WORK HARD. When you are finished, step away from your “office” and you are free to address the needs of yourself, home, spouse and children. Calculate how many hours are necessary for you to work at your business to make the income you require. Working a consistent number of scheduled hours each week in your office keeps you on top of that which needs to be done. You will find that you are no longer “winging it” in your business, customer care and follow up. Your frequent focus on your business will give you time to see ways to improve what you are doing!! End result is more $$$ earned! As I said try to work in BLOCKS, at least 90 minutes. You can really get through a lot of tasks in a single block. Make sure you have a plan. One suggestion is to keep a notebook and every time you think of something to do with your business, you jot it down. Then that becomes your POWER BLOCK list. Doing this eliminates running to your office every time you think of a business solution, an idea, the postcard you didn’t send or the email you didn’t answer….just put it on the list, assign it to your next working block and know it will get done!! Running a business with a family presents its own challenges. Consider these suggestions to help with the balancing challenge!! * I cannot stress enough how important it is to have a location in your home that is dedicated to your work. Psychologically it makes an amazing difference in your work ethic because it is tangible and when you enter your work space you can enter into your work mode vs your home mode. I your business involves a lot of calling you may consider installing a separate phone line (or at least separate ring tones) This one, simple thing really allows you to separate your business from family. If you cannot do this, then by all means, do not hesitate to turn off the phone! Make your own family meal time sacred…no phone calls!! Sometimes this takes drastic measures. Remember, there really is not any single thing in your business that could not wait 24 hours if it absolutely had to…so keep your perspective!! Your family will be so much more supportive if they feel your uninterrupted attention during family time! Remember just like if you worked for a company there is work time and family time. 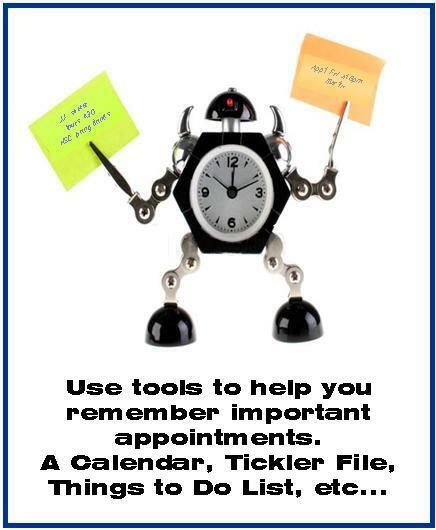 **Keep a detailed calendar with all your family and work important dates so that you can efficiently plan your work time. If your business involves sending out materials or making packets consider your kids, or hire a teenager to do all the stamping, you can have them assemble materials—they can help you with the filing, etc. ***Create a playgroup or hire a babysitter for a couple of hours a week. Take turns with other mothers taking care of each other’s kids. Find other parents that need “work time” and trade days taking care of each other’s children for a short time during the day. Example: You have their children Monday mornings from 9 am to 12 pm and you devote that time to the children. Then the next day they take your children for the same 9am to 12 pm time period giving you “work time.” Be careful though you may find yourself feeling so free you don’t “go to work” but do personal errands and that is a no, no! You can make trades for personal stuff too. It’s a Win-Win! ****Do errands together. Kids are very portable. Take them on the errands with you instead of waiting until they are at school or a sitter. Time away from the children should be spent working on the business and not on running around town on multiple errands. many of us go through periods of wondering if our business is what we really want to be doing…it is a lot of work if you are going to do well. It’s important to realize that “It’s not free money! !” …take a look around and try and find something you could do—that you would want todo–to bring in the money you are making with your home business, if there is nothing that even compares then you are absolutely doing the right thing. A successful business at home is out there for ANYONE who will put in the time and energy to make it work.